Preston North End boss Alex Neil says Leeds manager Marcelo Bielsa’s tactic of spying on opponents’ training sessions is “a little bit underhand”. The Argentinian admitted sending a member of staff to watch teams prepare for games at a 66-minute briefing with the media on Wednesday night that included a PowerPoint presentation. It came after Derby were forced to halt their pre-match preparations when spotting a Leeds employee at their training ground ahead of last Friday night’s meeting at Elland Road. Bielsa's side have played the Lilywhites twice this season - PNE won 2-0 at Elland Road in the Carabao Cup in August. In the league three weeks later at the same venue, Leeds ran out comfortable 3-0 winners. “What I do think is that where you can get a leg up and an advantage is hoping to deploy tactics that the opposition maybe won't be aware of,” said Neil, speaking at Springfields on Thursday morning. “That's been breached which I don't think should be the case. “I don't think it's normal practice in this country and I don't think it's sportsmanlike behaviour. “What amazes me is that he's just come out and said he's done it, said he's been doing for a while and doesn't make any apologies as if he's not going to continue doing it. “It's bizarre and if you ask any manager in this league or any other league 'would you mind that the opposition manager is going to come and watch your training session before the game starts', the answer would be yes. “I think it's a little bit underhand. Neil however isn’t calling for a severe punishment, the EFL and FA having launched investigations into the matter. 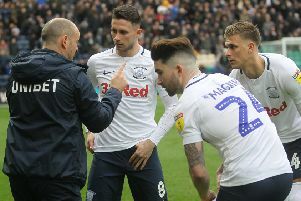 “They've chose to do what they've chosen to do and I don't know how you govern that because every training ground is different,” said the PNE boss. “As you're fully aware we've got a path at the side of ours so he doesn't need to hide in the bushes he can just stand at the side. “How do you stop someone walking down the side of the pitch? The level of Bielsa’s analysis on show in his presentation has been lauded by many but Neil says it is commonplace. “It does amaze me that everyone's saying it's a masterclass,” he said. “Every single team in this division will be doing analysis. “Every single team will have watched the opposition, every single team will have dossiers drawn up on players, fixtures, team line-ups. “That's pretty par for the course. “What's happened is that the general public, and some of the media, think we turn up and play five-a-side and go home and then when they do get a wee taster of what we actually do day-to-day and get exposed to it, it's groundbreaking. “Football's moved on leaps and bounds in the last decade in terms of sports science and analysis.